Single Column 4-Tier Locker 18" x 12"
Add private storage space to your changing room or locker room with this single column four door locker! This locker features a compact single column design with four separate lockers built into it, giving you optimal storage space for four employees in a compact footprint. To ensure each employee has adequate space for his or her belongings, each locker compartment measures 18" x 12" x 17". Its steel construction ensures long-lasting durability while the external neutral-colored paint helps it complement any room, and thanks to its lightweight structure, this locker can be easily moved when needed for easy cleaning. 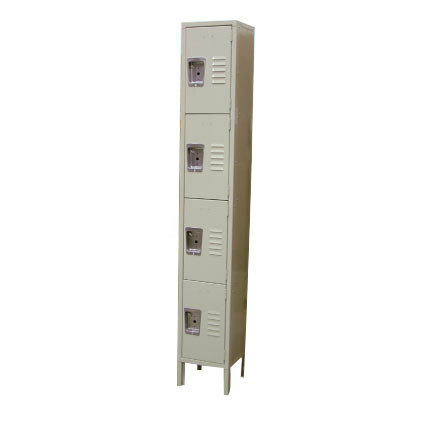 Winholt WL-21 Single Column Two Door Locker - 12" x 12"
Winholt WL-66/15 Single Column Six Door Steel Locker with Perforated Doors - 12" x 15" x 78"
Winholt WL-6 Triple Column Six Door Locker - 12" x 12"